This entry was posted in Academic achievements, Events, Students and tagged liberal arts, mock trial, political science on March 12, 2013 by Wire Eagle. AUBURN UNIVERSITY – The Auburn University mock trial competition team has won a bid to the opening rounds of the national American Mock Trial Association tournament in Memphis, Tenn., at the end of March. The Auburn team won the bid as a result of its performance during the regional tournament in February in Orlando. Team member Helen Agha received a “Best Attorney” award for her performance in the regional tournament. This entry was posted in General News, Students and tagged College of Liberal Arts, mock trial on January 31, 2013 by Wire Eagle. 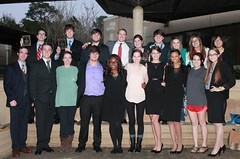 AUBURN UNIVERSITY – The Auburn University mock trial competition team took first place in the second annual University of West Florida Argo Invitational in Pensacola, Fla., Jan. 20-21, hosted by the UWF mock trial team and sponsored by Stetson University College of Law. Auburn University team members Luke Wareham and David Hathcock were named Best Attorney and Best Witness, respectively. Auburn’s winning team vied against teams from the University of West Florida, the University of Florida, Kennesaw State University, the University of North Alabama and Georgia Tech. Each team was required to compete in four trial rounds that were determined by local attorneys and judges. The teams are part of the American Mock Trial Association, a national organization that has sponsored mock trial competitions at the undergraduate level for 25 years. This entry was posted in Students and tagged Harrison School of Pharmacy, mock trial on August 9, 2012 by Wire Eagle. AUBURN UNIVERSITY – The new class of students in Auburn University’s Harrison School of Pharmacy will get a lesson in professional responsibility on Friday, Aug. 10, when attorneys, faculty and staff present a criminal case based on a factual incident involving the death of a young child from a pharmacist’s mistake. The Harrison School of Pharmacy hosts a mock trial at the conclusion of its weeklong Foundations of Pharmacy orientation course, which introduces first-year students to the Doctor of Pharmacy program and professional responsibility of pharmacists.